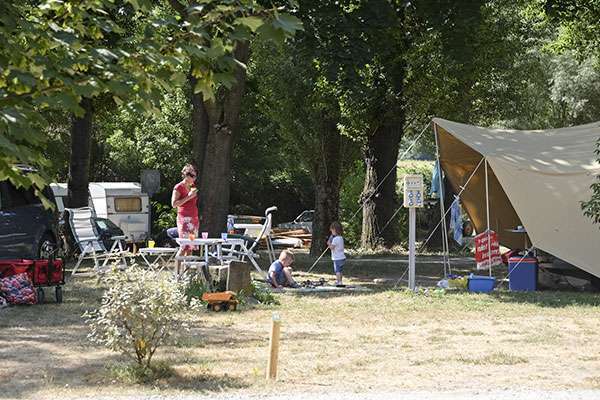 Huttopia Millau campsite is ideal for sports holidays! 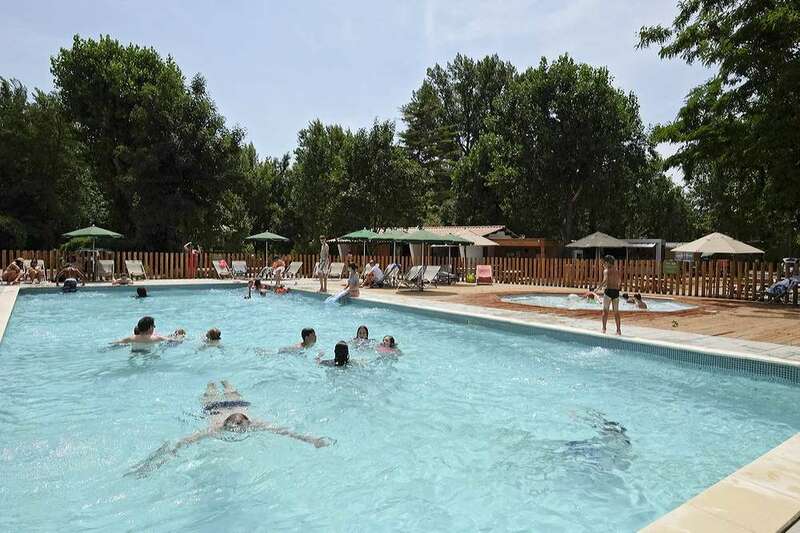 Located on the banks of a river, it is just a stone’s throw from the historic centre of Millau and boasts a beautiful swimming pool area for you to relax after an action-packed day. 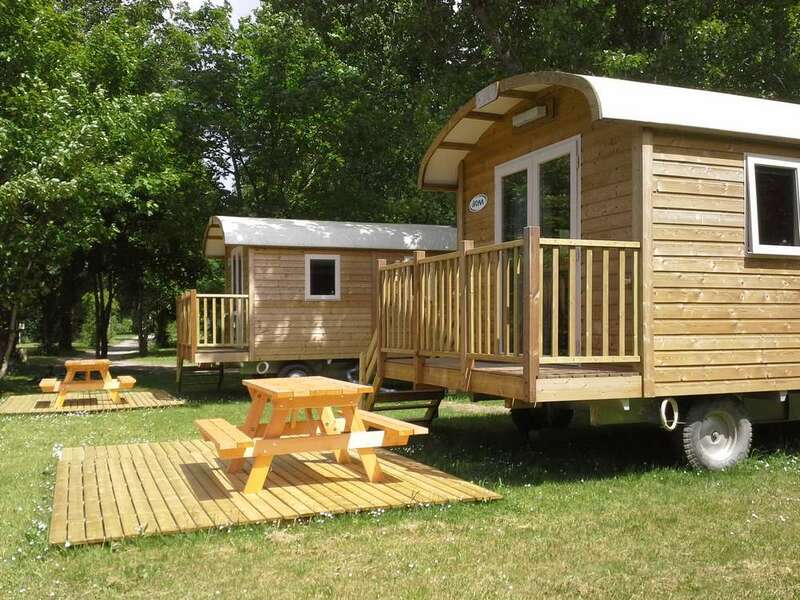 a private beach, playground, pétanque court, food services, activity programme for both children and adults, and a cosy and modern central lodge. 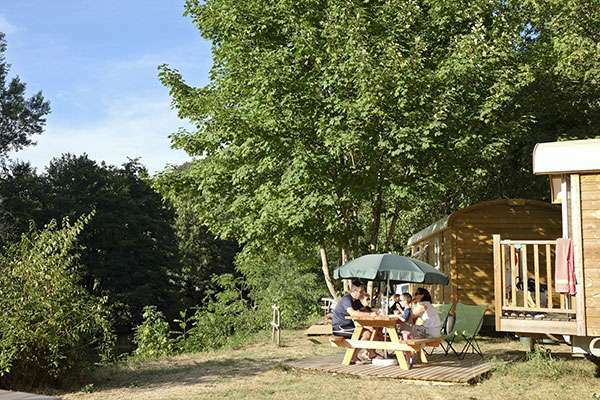 Camp with views of the river! 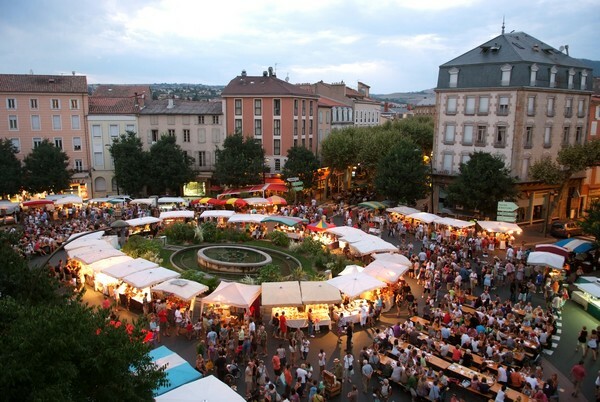 Just a stone’s throw from Millau, stay in the very heart of the Tarn! 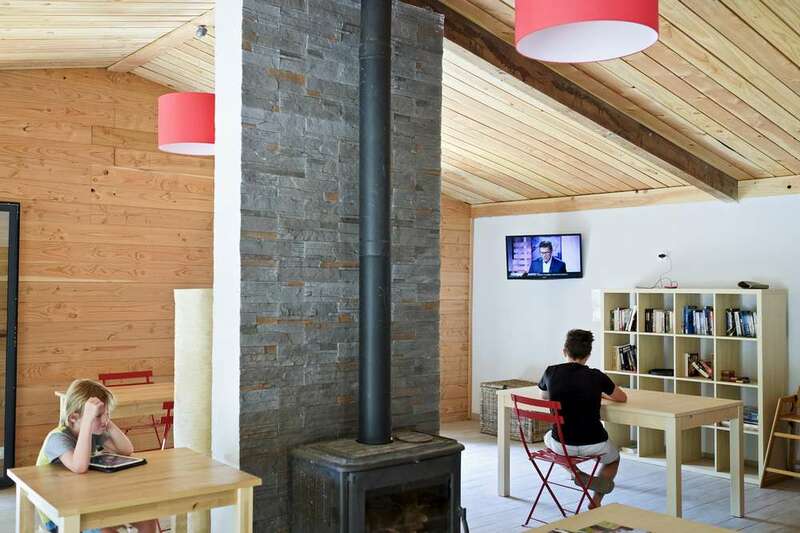 A destination where you can enjoy sports, leisure, and gastronomy: you won’t be disappointed with your stay! 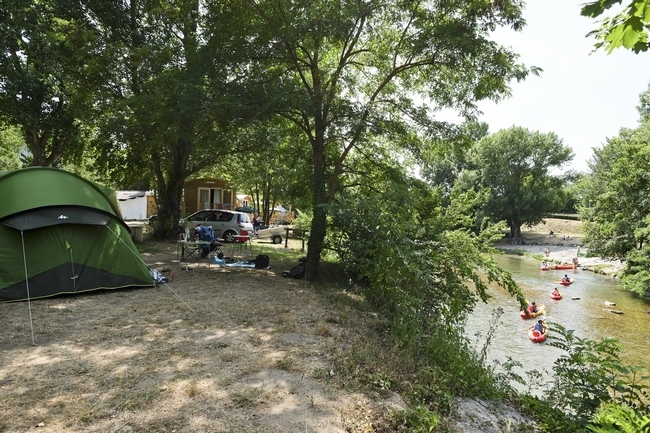 On the campsite, let yourself relax and unwind to the murmur of the river. 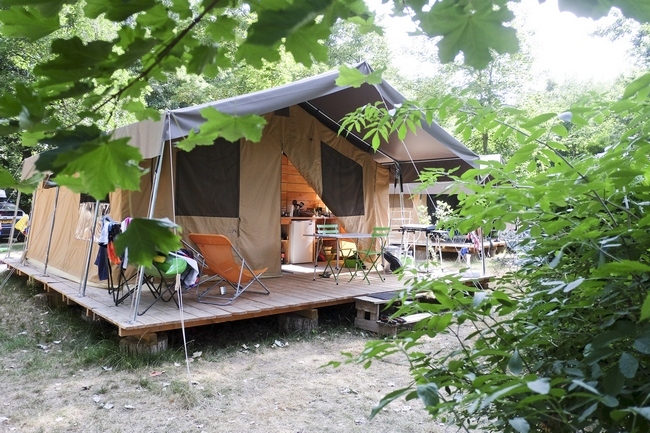 Whether as a group, a family, or a couple, you can camp the way you like best. 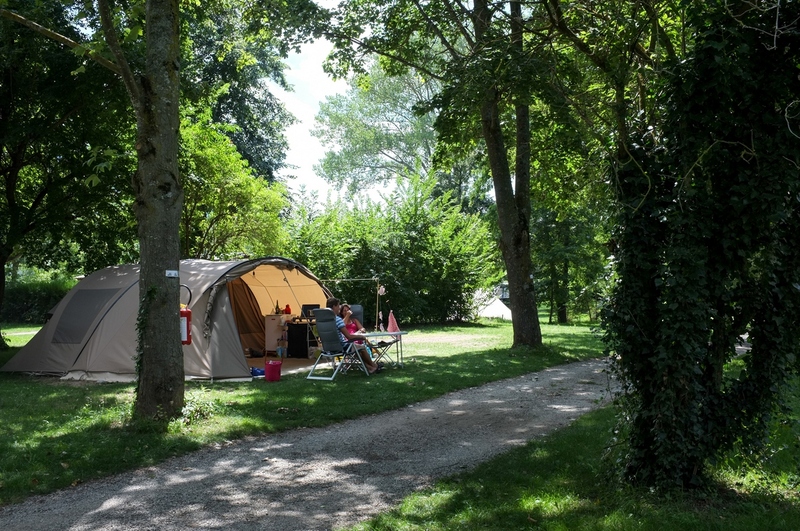 Spacious pitches, some of which offer views of the Dourbie and Tarn rivers, Wood & Canvas tents, Mobile-Homes, Wood Trailers… there is plenty of choice at Huttopia Millau campsite. Camp in the midst of nature, the way you like best… Choose from one of the 3 models of fully equipped Wood & Canvas tent, the Wood Trailers with their “bohemian” spirit, or the home-from-home comfort of a mobile home. 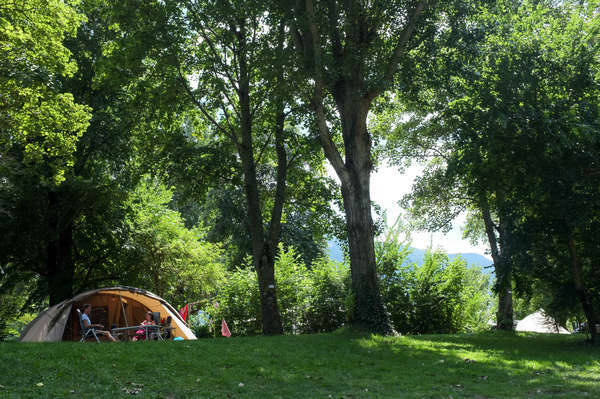 Camp in the midst of nature at the water’s edge at Huttopia Millau campsite. 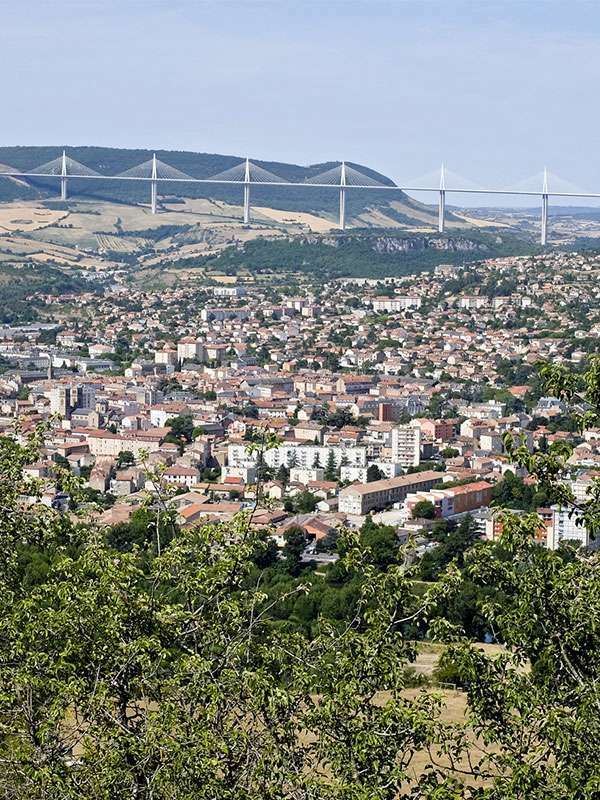 Come and enjoy an authentic stay in Millau! 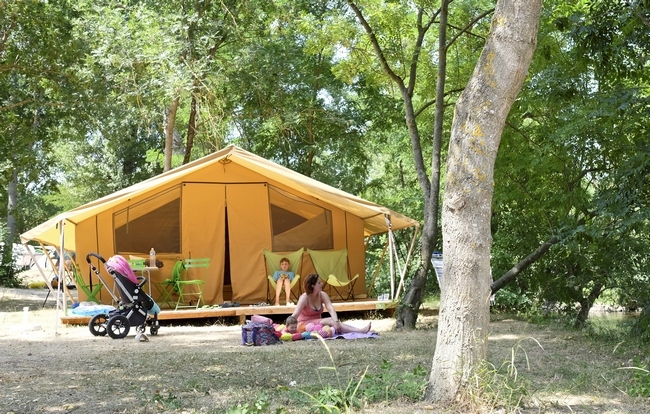 Set up your tent, caravan or camper van at one of our spacious pitch sites. 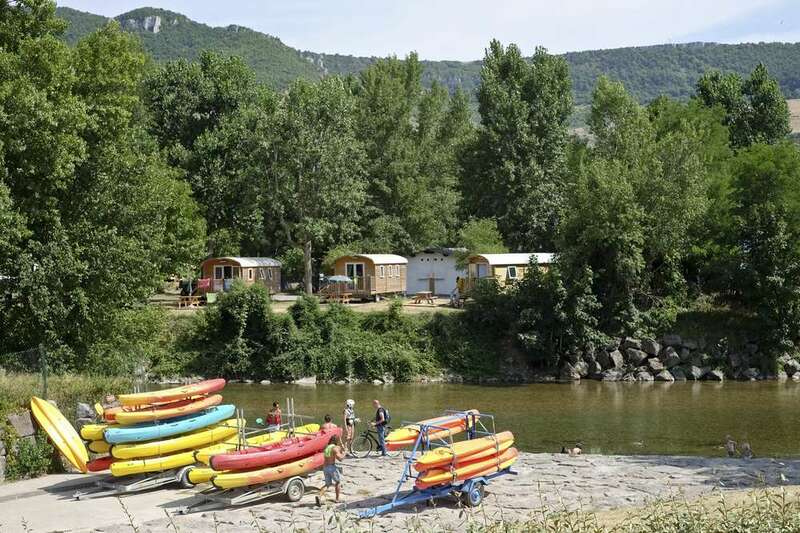 Lying on the banks of the Dourbie, the Huttopia Millau camp site is the ideal point of departure to explore the Aveyron local heritage assets or to try out a number of different sports activities out in nature. 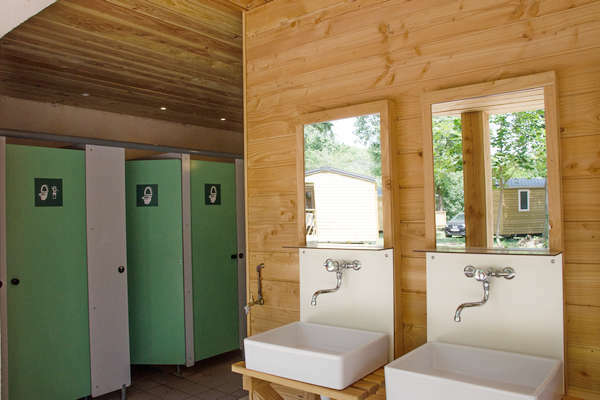 Bright, renovated washrooms are at your disposal at Huttopia Millau campsite. You will love taking a dip in the heated swimming pool after a day of hiking and sightseeing in the Tarn. 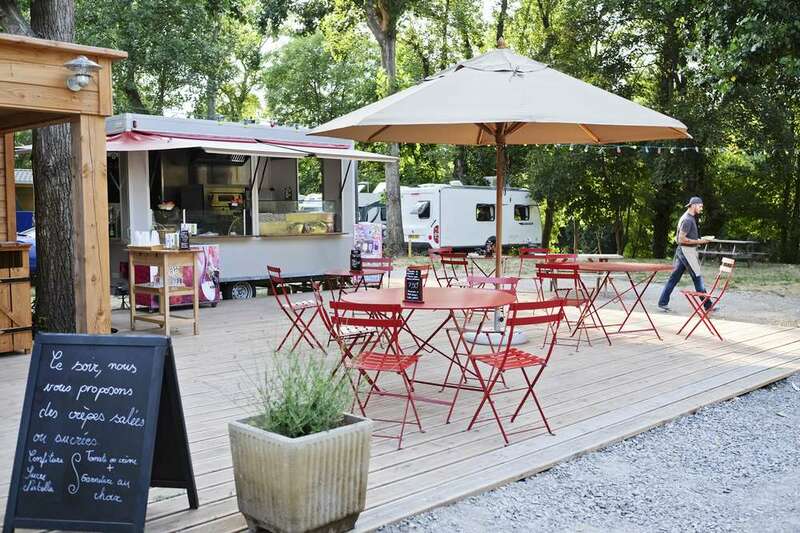 And for a great start to the day, try out our breakfast menus available at the Snack Wagon. We value being able to offer you simple, quality food services. 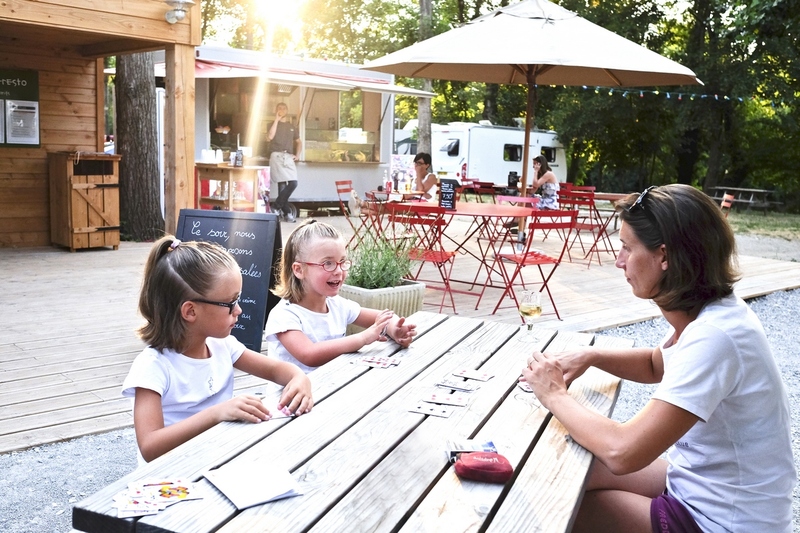 On the wooden terrace, you can enjoy getting together for drinks, ice creams, or delicious homemade pizzas at dinner time. 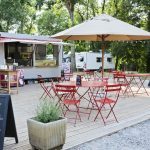 Huttopia Millau offers a mouthwatering menu! Have you just arrived? 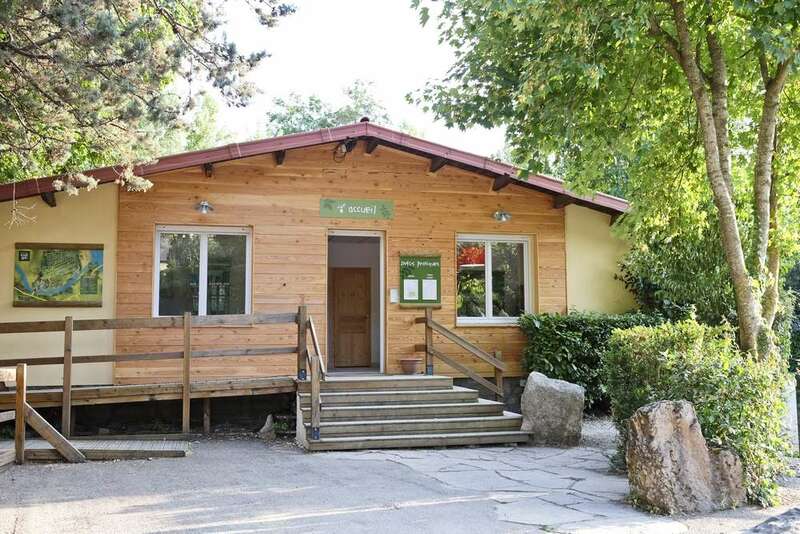 Come along to reception for all the information you need about your stay. 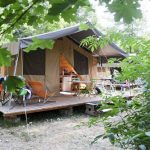 The campsite team will be happy to let you know all about the best activities, most beautiful sights, and unmissable events in the region. 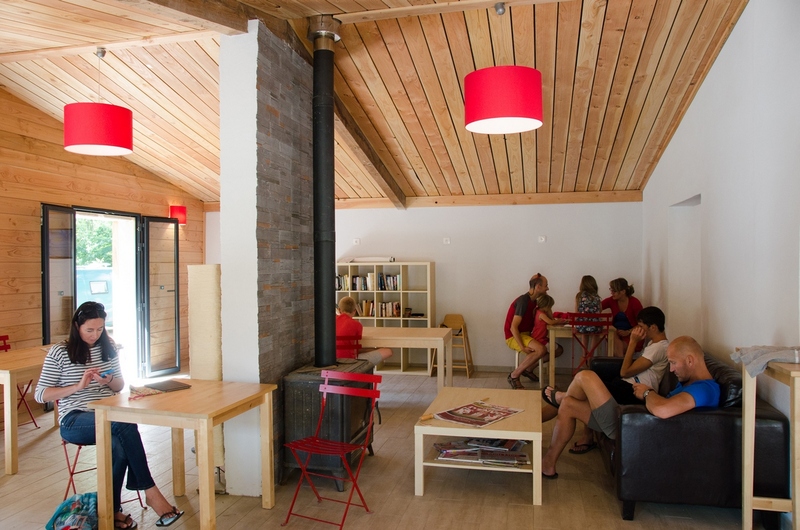 There is free wifi in the Central Lodge and at Reception. 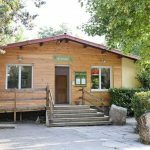 Supermarket, Petrol station, Bakery, Bank, and Tourist Office 1 km from the campsite. Relax by the beautiful heated swimming pool and paddling pool or splash about in the river… At Huttopia Millau campsite, you can enjoy water in all its forms! 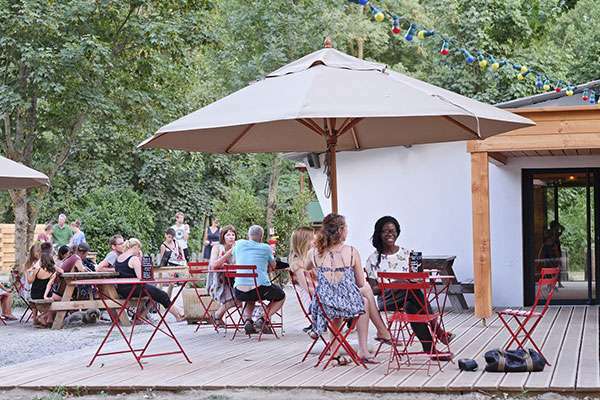 Sun loungers are also available on the wooden terrace for you to settle back and unwind. 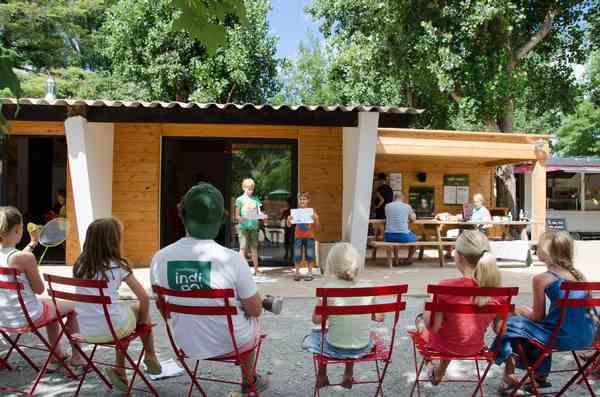 There are a range of free leisure facilities for your use: board games, ping-pong, petanque, and a playground for the little ones. 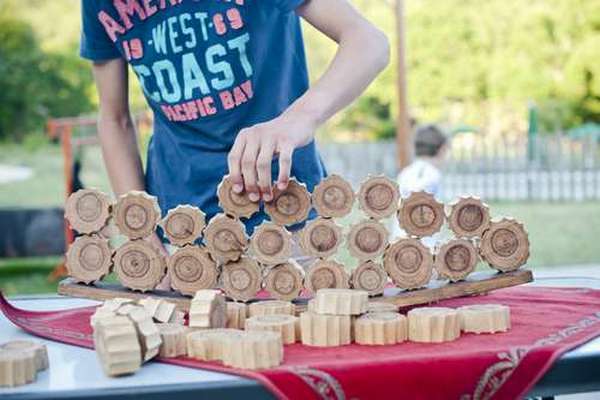 During the day, enjoy a range of activities for all the family. 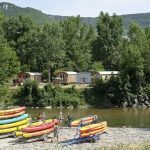 Archery, canoeing, sports tournaments… the choice is yours! 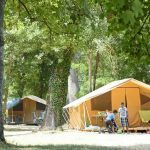 In the evenings, live music concerts, themed meals, open air films, and games evenings… adults and children are in for a treat. 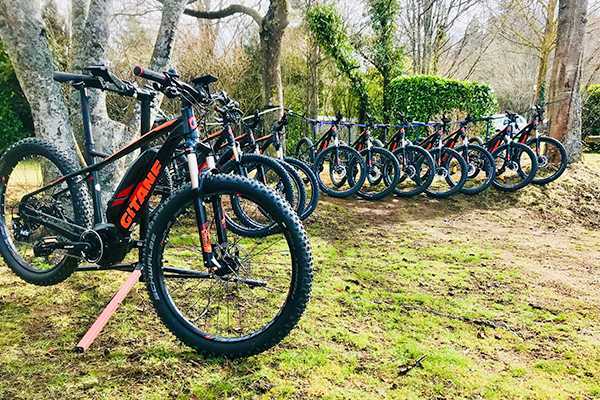 Explore the Aveyron in true freedom on an electric mountain bike. On mud, in sand, uphill… nothing will stop you! Available for hire by the day. 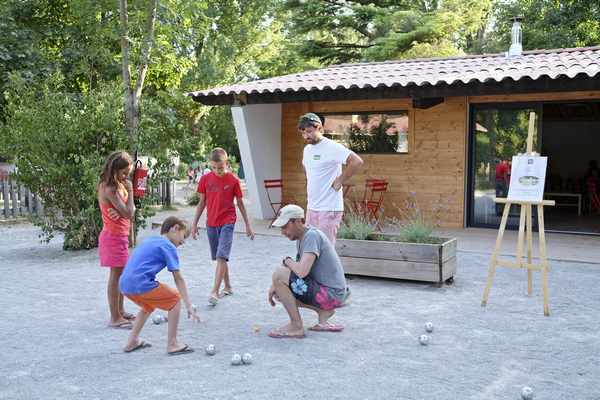 With your family or friends, compete over a game of giant mikado, toad in the hole, or shuffleboard. 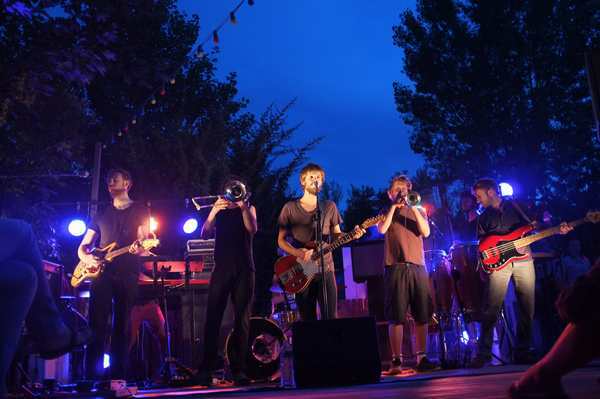 Every week this summer on the Huttopia Millau campsite terrace … Let yourself be rocked by artists from all horizons! 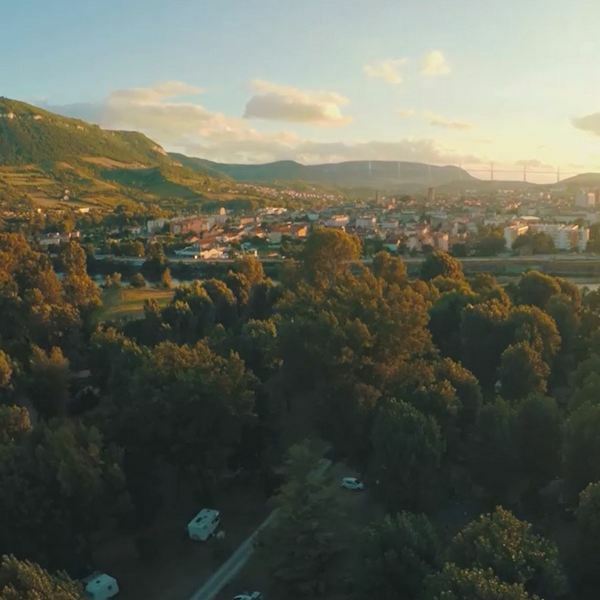 A region full of life that should be lived to the full! 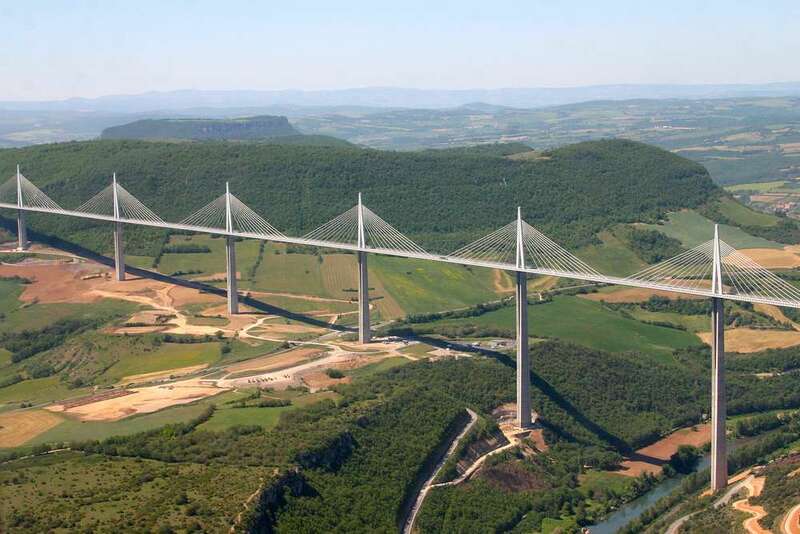 What awaits you in Aveyron? 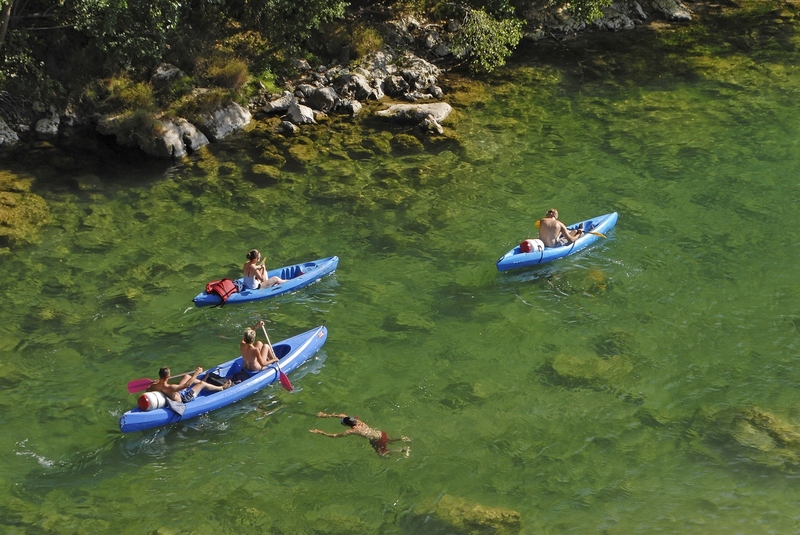 A SPORTS DESTINATION IN THE HEART OF NATURE! 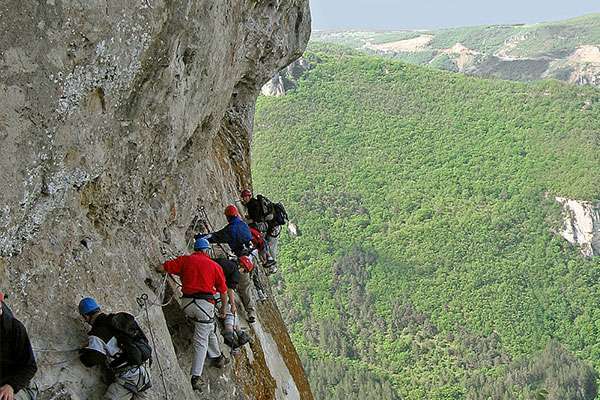 Paragliding, via ferrata, mountain biking, caving, canoeing, rock climbing… it’s time for adventure! 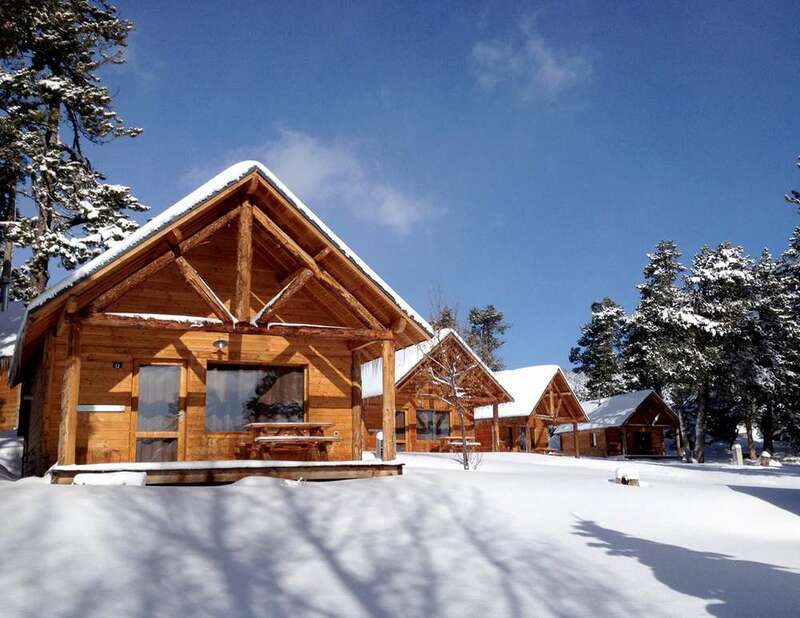 Enjoy a holiday escape in a region known for its vast, open landscapes. 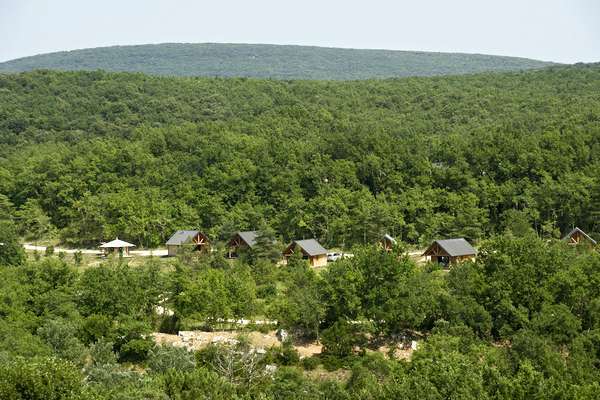 Several hundred kilometres of marked footpaths await you, from short family walks to demanding hikes. 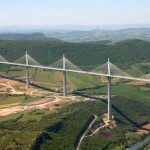 It is to the Aveyron what the Eiffel Tower is to Paris… and a few centimetres higher too! 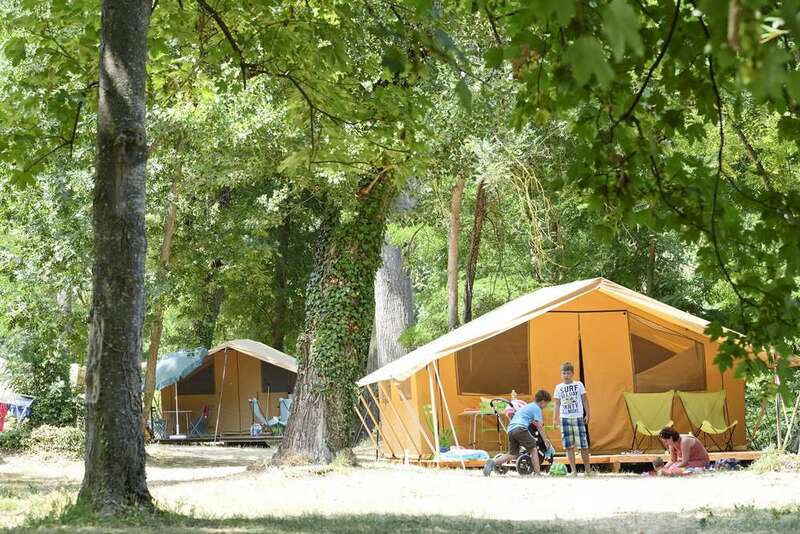 An exceptional site demonstrating technological prowess in the heart of a resplendent nature… Discover the structure in the Jardin des Explorateurs, by quad bike, canoe, or microlight. 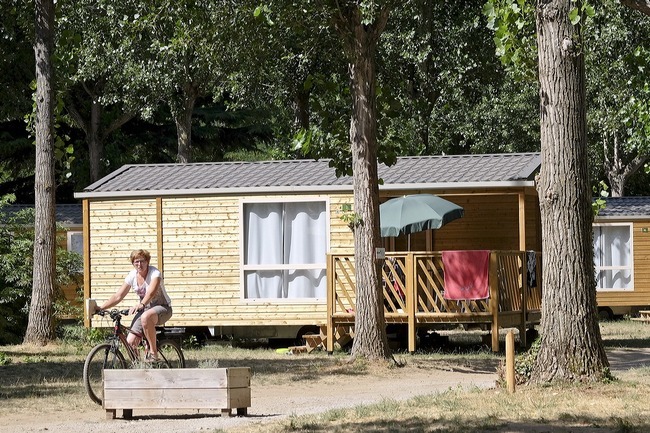 A destination with exceptional regional produce and countryside. 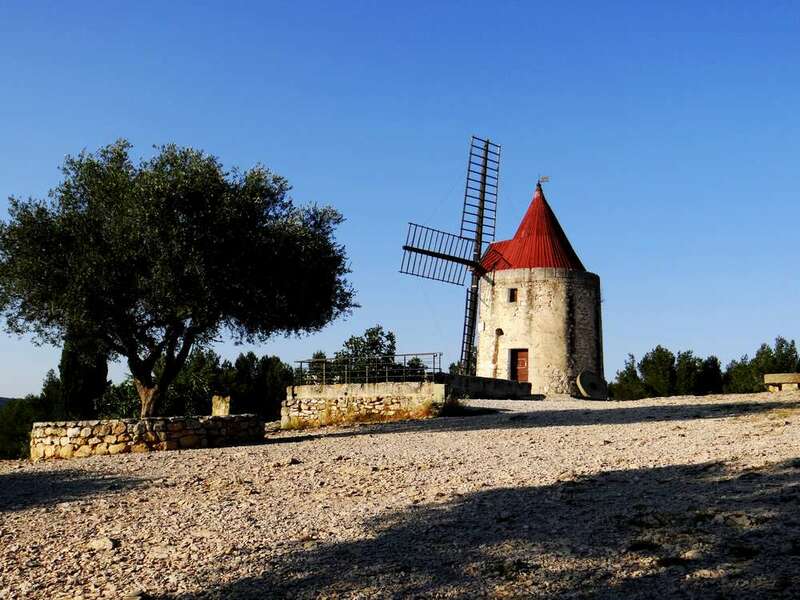 Enjoy authentic walks amid traditional villages and unspoilt wild landscapes. 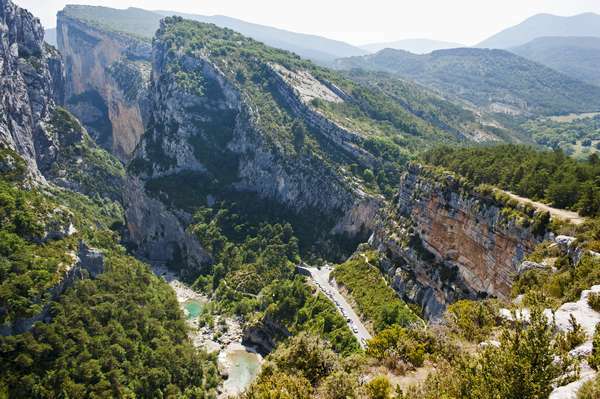 The Tarn Gorges: a unique national site! 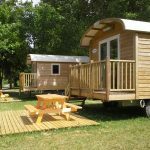 In the heart of the Grands Causses Regional Park, explore this prestigious site. History lovers? 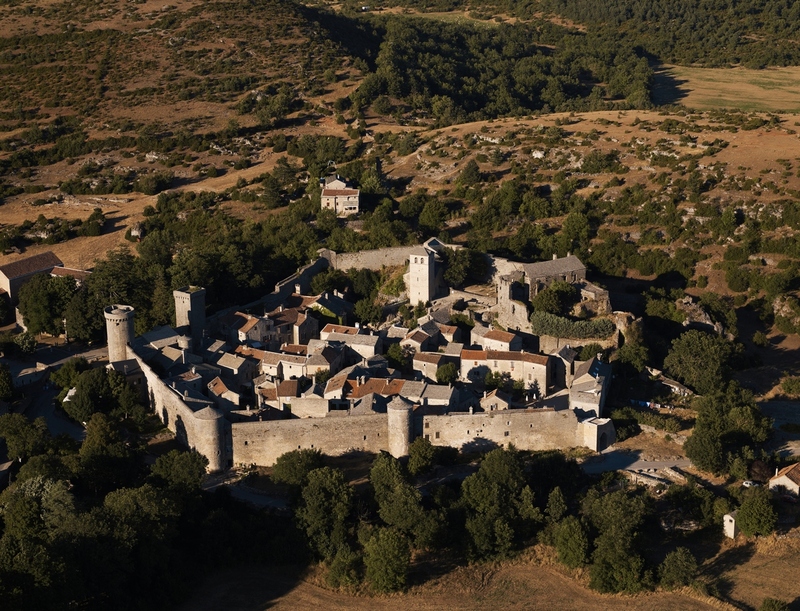 Visit the Aveyron’s 5 exceptional sites of the Knights Templar and the Hospitallers. 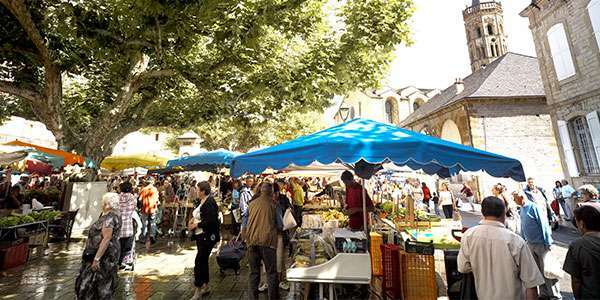 Gastronomy lovers?  Visit the caves where the famous Roquefort cheese is made, open throughout the year, just a stone’s throw from the sheepfolds. Very good. Would definately book again. 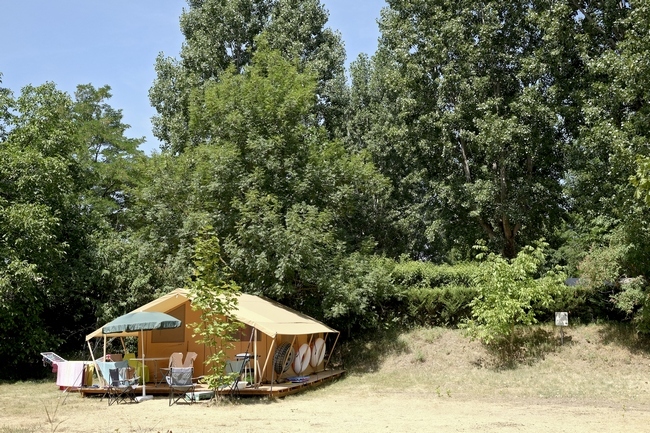 Only stayed one night but would like to return, maybe next year. Thank you.